Please email CGW for the proper paperwork. Box your 97 slide and barrel in a USPS small flat rate priority box and send it to CGW, see our address on the home page. We will contact you for payment when the project is complete, or you can include a check or money order. Cost of $190.00 for the conversion plus $8.00 return USPS. Allow 4 weeks turn around. 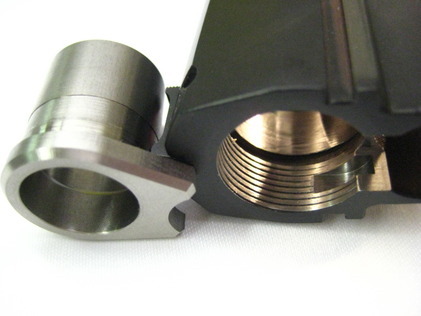 CGW Precision bores and slots the 97 slide to accept a stainless steel 1911 type match barrel bushing precision fitted. At lock-up there is zero play at the barrel muzzle resulting in unparalleled accuracy. Includes all machine labor to bore the slide, slot the slide, precision fit the bushing to the slide and barrel to the bushing. Includes all parts and bushing wrench with instructions on bushing removal. CGW uses a stainless-steel “USA Made” barrel heat treated bushing and the barrel is crowned 11 degrees and deeply blued, which looks stunning when set inside the stainless steel bushing. 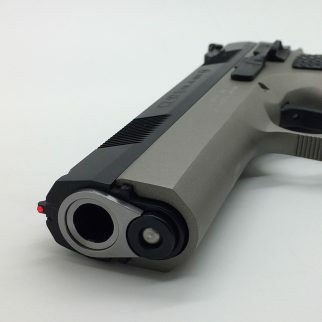 CGW has engineered a better CZ 97B/BD. 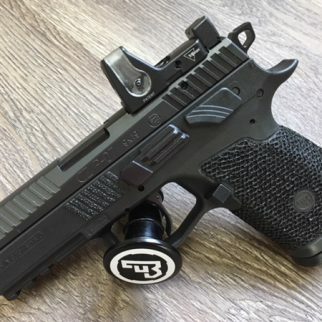 CGW pioneered the barrel bushing modification for CZ’s, which makes the 97 one of the most accurate 45’s on earth regardless of price. This also increases the reliability since in some occasions the screw-in bushing can rotate during recoil. You can ship your slide in a small flat rate USPS Priority Mail box. We only need the slide and barrel. Please email Cajun Gun Works for our slide paperwork. Allow 4 weeks turn around. Our best 25 yard, sand bag rested 5 shot group with match grade hand loaded ammo is 9/16″ center-to-center with the CGW bushing modification.